I was originally attracted to this book by its title and cover. Yes … I am guilty of judging a book by its cover. The title was intriguing to me because I thought, ok, this book is going to be funny or at least tongue in cheek. Second, the image on the front cover depicts the outline of a person’s head and shoulders, and then is filled in with shapes that kind of look like a city map. This has a very significant tie-in to the story, but I didn’t know that at the time. My impression after I finished the book is that the title is misleading. 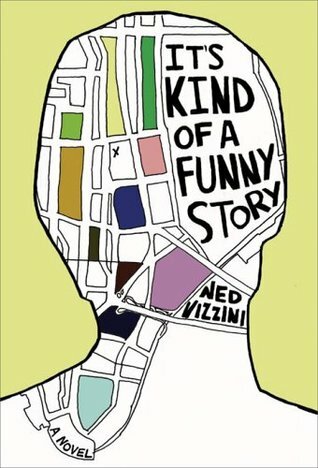 Yes, this story is “kind of ” funny, but only because the narrator, Craig, sees his situation in a light-hearted manner. However, other than that, the subject matter of the story is not funny at all. Craig is 15 and suffers some sort of nervous breakdown which leads him to call the Suicide Hotline and check himself into a psychiatric hospital. He’s been overexerting himself to get into a prestigious high school, and now that he’s in, the pressure to keep up with the other gifted students proves to be too much. I think the book does a good job of capturing what it’s like to be a teen suffering from depression. However, it seems like once he’s in the hospital, he basically cures himself by discovering this artistic talent that he had forgotten he had. The true healing process from depression is much more of a long-term thing, maybe even a lifetime. For Craig, it’s a matter of a few days where he decides to switch schools, and comes out of the hospital with a new girlfriend. It just seemed to wrap up in a nice little package, kind of like a TV episode. For the teen audience it’s aimed at, this might fly, but for me, I wondered what would happen next for Craig. Would he leave the hospital and things would be ok for a while, and then he would relapse a few months down the road? I did enjoy the depiction of the fellow patients in “6 North” as it was called. Side note: I had a relative spend some time in a psych ward in a hospital and it was called “Center 5” so this definitely reminded me of that. In general I am kind of fascinated with mental illness and the many ways it manifests, so it’s a topic I am always interested in reading about. Muqtada, Humble, Human Being, Jennifer and other characters seemed very real and believable. So I guess this is kind of a mixed review for me. Overall it was an enjoyable read because the main character was smart and witty and self-aware. The resolution troubled me, but for a teen novel I’m not going to overanalyze it. That is one more book for my TBR Pile Challenge this year… which it is looking like I’m not going to finish. Although, I do have a plane ride in a few weeks that may help me knock at least one more book off the list! Wow. I had no idea. Thank you for commenting! I think you have every right to analyse it even though it’s a teen novel -since the book helps shape some perception of mental illnesses. Great review, the narrator sounds like he has a compelling voice.